Here’s a little video selfie of me breathing. Pretty exciting stuff, eh? The reason I look so strange is that it’s taken with a thermal camera: the white and yellow areas are warm, the blue and black ones colder. I haven’t decided whether or not it’s an improvement on my normal appearance. One reason for our interest in this at the Lab is that you can clearly see my nostrils getting cooler as I breathe in, and warmer as I breathe out. So a thermal camera is a pretty straightforward way for a computer to measure my breathing rate. But I had some fun playing with the camera at home, too. 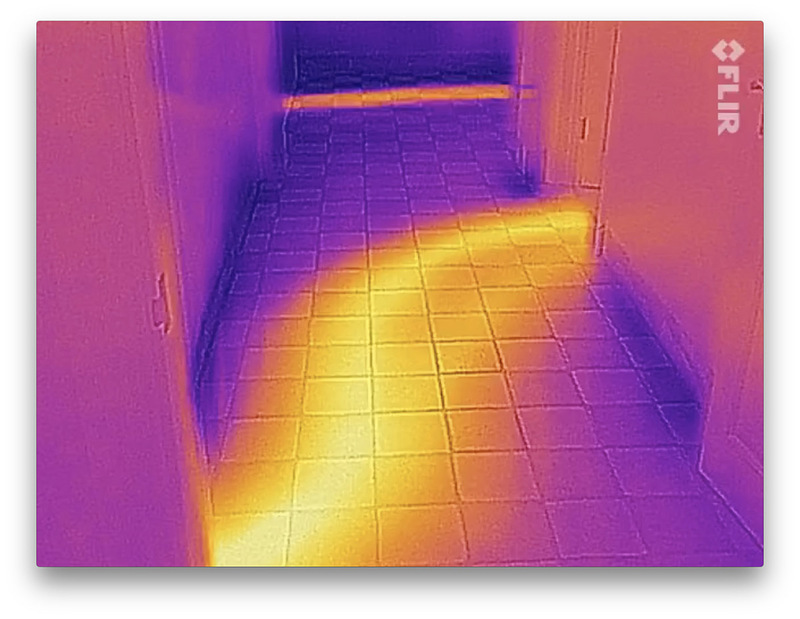 Pointing it at my hall floor showed glowing tracks where the hot pipes run under the tiles, allowing me to see how the radiators in different rooms are connected up. When I was looking around upstairs, I noticed some light patches on the floor and wondered what they were. It took me a moment to realise that Tilly had trotted up behind me to see what I was doing, and had silently departed, leaving only warm paw-prints behind her as evidence. All you need is Lovie? Last night we went into London because the kind people at the Lovie Awards, the European branch of the (rather better-known) Webby Awards, had been good enough to give me an award, mostly for the work that friends and I had done in creating the first webcam. I was a bit embarrassed about this, partly because I didn’t think I deserved it, and partly because of the name, but I got over the latter, at least, when I discovered that it’s in honour of Ada Lovelace. Anyway, the tradition is that you have to give a little speech containing the word ‘Love’. The other tradition, which nobody told me, is that the speech should be about 30 seconds, which is why I look a bit more flustered than usual here! I was trying, not very successfully, to edit my speech on the fly. But I got away with it because mine was the last award of the evening. It was a great and responsive audience, which, sadly, you can’t hear on this video. I wrote about this a few years ago but it’s still a handy and not-very-well-known hidden feature of the Mac’s System Preferences. NOTE that on some Macs, especially recent Mac Book Pros, this only works if you have external displays attached. A quick recommendation of the dBpoweramp software, if, like me, you should find yourself ripping large numbers of CDs. My latest little screencast shows some of the things you might not have discovered in the Preview app on the Mac. Also available on Vimeo here. My car now has a web page. Sadly, it’s for my own use and not for public consumption, but I made a little video about it anyway! Also available on YouTube if preferred. Wow. She’s still got it, hasn’t she? Thanks to Rory C-J for the link. The discussion below between Neil deGrasse Tyson and Richard Dawkins is mostly about atheism and belief, and the degree to which the atheist viewpoint can or should be promoted. But at one point, about 1 hr 3 mins into the video, Tyson talks about why he’s worried that there aren’t more scientists in politics. Everyone seems to be a lawyer. And his concern is not for the perhaps more obvious reasons of, say, ensuring sufficient funding for research. It’s that lawyers are people trained to be good arguers of a point of view, regardless of whether it’s the view they necessarily hold themselves. When we have two scientists, if we disagree, it’s because one of us is wrong, or the other is wrong, or we’re both wrong… and we both agree with that fact — that those are the three possibilities that exist, and we’re both waiting for more or better data, to resolve it — so that we will one day agree, and then go out and have a beer. Lawyers don’t… it doesn’t happen that way… any time I’ve seen lawyers in conflict. Now, I’d be a bit more generous to lawyers than that, perhaps because I’m married to one! Good lawyers are at least trained to examine all the possible arguments, which is a very valuable skill, not taught to everybody. In some ways, I think, they’re almost scientists. But this doesn’t change the fact that, at least outside the academic sphere, they are usually exploring these possibilities on the behalf of a client, so they’re looking to turn their awareness of the other arguments into a reinforcement of a predetermined point of view. This makes them effective, but undesirable, politicians.